Magnetic amplifiers (aka "mag amps") use a property of saturated core inductors (saturable reactors) to obtain signal amplification via a transformer-type plus diode-assisted voltage multiplication. Magnetic amplifiers were preferred over vacuum tube amplifiers in some circuits because they do not require a high bias voltage, are generally smaller in size, are quite robust and are practically immune to microphonics. Their biggest limitation is bandwidth. The high number of turns in the core provides a lot of interwinding capacitance so the self-resonant frequency is in the low megahertz range. Additionally, the need for the magnetic amplifier reactor to operate in a saturated condition further imposed a limit on the frequency response. Even today, there are some critical applications that exploit the fool-proof and ultra high reliability nature of the magnetic amplifier. This article goes into the details of operation both as amplifiers and as bistable multivibrators. Patent Engineer Berkeley Div., Beckman Instruments, Inc. Tiny bobbin of wire used in the Ferristor, shown beside vacuum tube for comparison. New "Ferristor," small, ultra-fast saturable reactor, has high reliability for industrial automation needs. The demand for reliability in electronic equipment is constantly increasing. 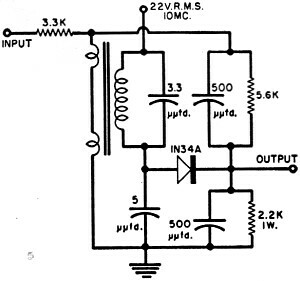 This demand has revived interest in one of the earliest practical amplifiers of electric signals - the magnetic amplifier. One of the first models was built by the famous American radio pioneer, E. F. W. Alexanderson, over forty years ago. 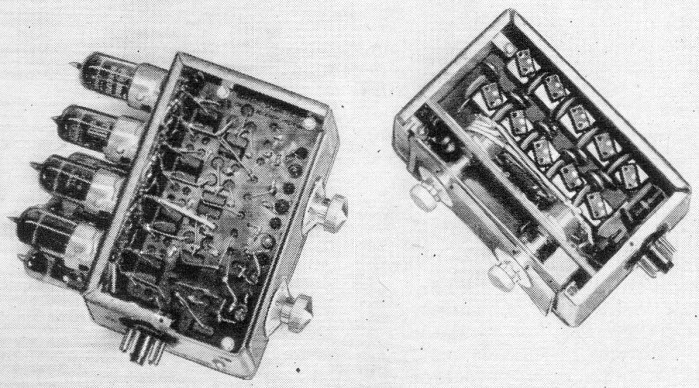 By 1945 the magnetic amplifier had proven itself dependable by years of service in military and industrial control applications, but its usefulness was limited because of its long response time. This slowness was due to the necessarily low "carrier" frequencies. 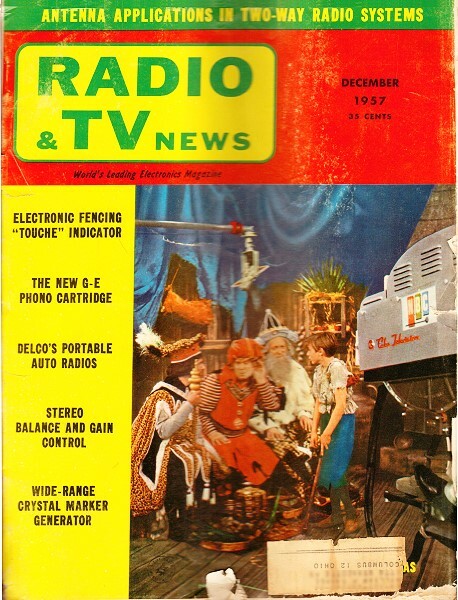 The magnetic amplifier "carrier" is basically the same as the carrier used in radio broadcasting. A relatively high frequency wave is modulated by or "carries" the lower frequency "intelligence" or desired signal. High core-material losses had precluded the use of high carrier frequencies. But now, development of the new low-loss, high-permeability ferromagnetic alloys has made magnetic amplifiers practical for electronic circuits. With the reduction of core losses, carrier frequencies up to 10 megacycles are possible. This gives magnetic amplifiers the fast response required in modern electronic instrumentation. One of these new units is the "Ferristor" saturable reactor, made by the Berkeley Division of Beckman Instruments, Inc. It is a tiny device, not much larger than the eraser on a pencil. Technically it is a subminiature, ultrafast saturable reactor. Fig. 1. 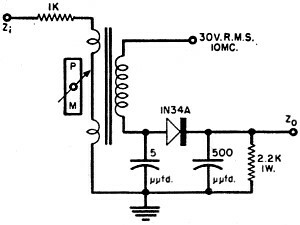 Basic magnetic amplifier. Permanent magnet used to provide biasing effect. Fig. 2. Curves of ferroresonant operation. Fig. 3. Typical ring counter stage. The varistor is used for circuit stability. Fig. 4. Typical one-shot multivibrator. Fig. 5. Circuit of current discriminator. The "Ferristor" reactor is very simple in construction. It has two solenoid-type windings on a magnetic core. The inner, or carrier-current, winding has a few hundred turns of very fine copper wire. The outer, or control, winding has from one thousand to four thousand turns, depending on its intended use. The core is a few turns of sheet magnetic material, 1/8000 of an inch thick, rolled into a scroll. The finished assembly is completely sealed by "potting" it in epoxy resin. These units can be used in at least two fundamentally different ways, either as magnetic amplifiers or as bi-stable ferroresonant elements. The latter use requires only one winding however. When this reactor is used as a magnetic amplifier, Fig. 1, a small load capacitor is placed in series with the carrier winding. Changes in control current vary the core permeability. This changes the effective inductance of the carrier winding. The carrier current is thus linearly modulated by the waveform of the control current. The magnitude of the carrier current and the amplitude of the r.f. 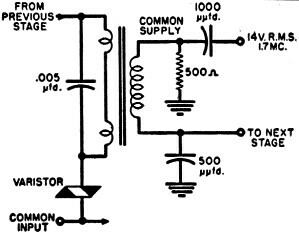 output (across the load capacitor) vary in step. The amplified input waveform is "recovered" by rectifying the output and filtering out the r.f. The orientation of the rectifying diode determines whether the output is in- or out-of-phase with the input. The unit amplifies because the carrier-current variations are much larger than the control current changes. The extreme sensitivity of magnetic amplifiers enables them to amplify signals weaker than vacuum-tube shot noise. The parts of a magnetic amplifier circuit may be compared to the parts of a vacuum-tube circuit. The control current corresponds to the control grid voltage; the carrier supply compares to the "B+" supply; the carrier current is analogous to the plate current; and the load impedance corresponds to the plate load. 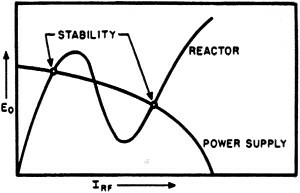 The other basic application of "Ferristor" reactors employs the phenomenon of ferroresonance to produce a bi-stable characteristic. With this characteristic they can maintain either of two possible stable states indefinitely. In ferroresonant operation a capacitor is selected to resonate with the partially saturated carrier winding inductance near the applied frequency. The resulting circuit has an S-shaped curve of voltage versus current. See Fig. 2. The capacitive reactance is constant with increasing current. But when the current through the iron-cored carrier winding is increased it becomes saturated. This decreases its effective inductance and the inductive reactance of the circuit. Over a limited range, either of two different stable values of current can exist, for one given voltage. In circuit operation this voltage is actually the r.f. supply voltage. The intersections of the curves of power supply output and positive-slope circuit impedance are the two stable states. In the low current, or non-saturated state, the circuit is inductively reactive. In the high current, or saturated, state it is capacitively reactive. In ferroresonant operation the control current does not flow constantly. Instead trigger pulses of control current are used to induce partial saturation of the core. It can be saturated by an external magnetic field, by d.c. in the control winding, or by r.f. in the carrier winding (which makes it capable of self-saturation). A d.c. trigger pulse is applied through the control winding to raise the carrier current to the high state. The trigger pulse can be of either polarity, since both will temporarily reduce inductance. To make it change states, the core must be partially saturated to the point where any current increase decreases the inductance enough to drop the output voltage. Thus a pulse causes the current to re-generatively jump to the stable high current point. The interdependence of low inductance and high current keeps the circuit latched in this state of self-saturation. The unit cannot return to the low-current state until its supply voltage is reduced below the level where self-saturating current flow starts. A ferroresonant flip-flop can be constructed by running two reactors in parallel. They must have a common coupling element-capacitor or triggering reactor - to the r.f. supply voltage. If memory and gating circuitry are added, the flip-flop can be operated with a single input. An extended version of the flip-flop is the ring counter, Fig. 3, composed of several reactors operated in a closed loop. The ring counters are connected to the supply voltage through a common coupling element. Its value is chosen so only one unit at a time can draw high current. If two or more try to jump high, the extra current through the common coupling tends to drop the voltage so neither can be high. The action in a ring counter is not random. In one common circuit, each unit has a directive circuit to transfer the high current or "active" state from one stage to the next stage in turn with each successive input pulse. The varistor associated with the "active" unit has the largest current through it. Thus it will conduct the most when the ring is pulsed. This increased current also flows in the control winding of the unit following. The new unit then goes into the high current state and the previous unit is forced out because of the action of the common coupling element. The action of the stages in a ring counter may be compared with several glow regulator tubes in parallel across some voltage through a common resistor. As the voltage is raised, one tube will strike first, lowering the voltage to its regulated value. This prevents the other tubes from firing since the voltage has been reduced below their firing potential. These units can be used in a one-shot multivibrator circuit. See Fig. 4. This circuit generates a constant-width output pulse and steepens the leading and trailing edges of a slow pulse input. The one-shot circuit is made from the magnetic amplifier circuit by adding a capacitor and resistor in series from the output to the input. The diode is oriented for in-phase output. The output pulse width is determined by the discharge time of the resistor and capacitor. The circuit is triggered by an input pulse which induces partial saturation. Regeneration causes the carrier current to jump to the fully saturated state. A change at the output is reflected back to the input where it adds to the original input signal. This additive action takes the output practically instantaneously to its saturated value, where no further change is possible. While current from the capacitor keeps the core saturated the output stays in the high state. But as soon as the charge leaks off, the output drops back to the low state. 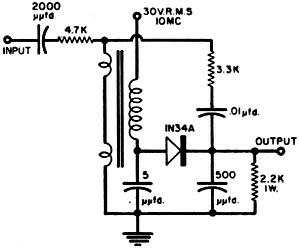 This circuit can put out 25-volt, 4-microsecond pulses into a 1000-ohm load. This can be altered with bias changes. Bias can also be used to cause the circuit to trigger at a particular point on the input wave. The circuit shown requires a 15-volt positive pulse drive and puts out a pulse 40-microseconds wide. A current discriminator, Fig. 5, which generates rapidly changing waveforms from slowly varying input waveforms, can also be made from these reactors. It is the analogue of the familiar vacuum-tube voltage discriminator, or the Schmitt trigger circuit. Ferristorized decimal counting unit (right) compared with the vacuum-tube version. To form this circuit positive feedback is added to a magnetic amplifier through a series resistor from the output to the input. The diode rectifier is oriented for in-phase output. The discriminator has two possible stable states, either high- or low-current output. When the input current is above a certain value the output will be saturated. When the input current is below another certain value the output current is low and non-saturated. The circuit "hysteresis" is the difference between these two input current values. The magnitude of the hysteresis depends on the size of the feedback resistance. When the value of input current is within the range of these values the output state depends on whether the input was previously above or below the "hysteresis" range. The change of state is caused by regeneration. In the circuit shown the hysteresis is 130 microamperes. The current discriminator may also be used as a pulse gate. A d.c. bias fixes the static level of the control current without input pulses. If the d.c. level is high the gate is "open," because input pulses can reach the region of partial saturation to produce output pulses. If the d.c. level is low the gate is "closed." "Ferristor" reactors are very versatile. They can be used in many circuits including oscillators, multivibrators, discriminators, balanced or differential amplifiers, coincidence gates, ring counters, binary counters, stepping registers, and many others. These reactors are almost completely unaffected by shock, vibration, temperature, humidity, altitude, time, and the other things affecting vacuum tubes. They are reactive rather than dissipative devices so they generate little heat and there is practically no power waste. For these reasons they should last almost indefinitely. 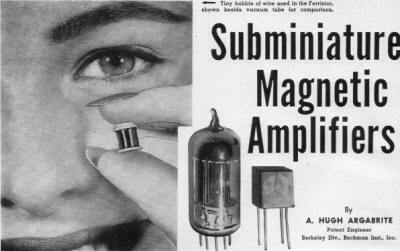 The invention of the audion displaced the original magnetic amplifier from favor. But now its modern descendant - the "Ferristor" reactor - with its greater inherent ruggedness may replace the relatively short-lived vacuum tube for certain applications requiring good reliability.